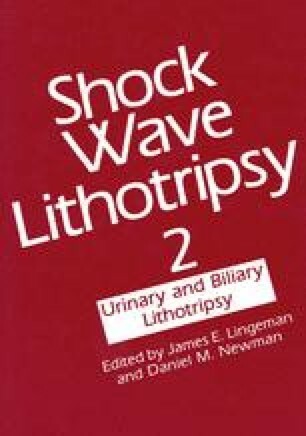 Until now no upper limit has been established for the maximum number of shock waves which should be applied in one treatment. In this study, patients were treated with extracorporeal shock wave lithotripsy (ESWL*) on a modified, anesthesia-free Dornier HM3 lithotripter. The data of 60 consecutive patients treated with fewer than 2,000 shock waves (Group I) were analyzed and compared to the data of 69 consecutive patients treated by more than 4,000 shock waves (Group H). The majority (42 patients) of Group H received three or four ESWL treatments. No perirenal hematoma was observed in either group. The rate of postoperative fever was similar for both groups. Increased levels of serum creatinine occurred in three patients in Group I and two patients in Group H. Follow-up examinations six months after the last shock wave treatment revealed normal values of serum creatinine except in one patient with chronic pyelonephritis who had been treated by ESWL on both kidneys. No increased perioperative morbidity was observed in this group of patients treated with a higher number of shock waves on an anesthesia-free shock wave system. As the retreatment rate is high on these systems, especially for bigger stones and stones with a low fragility, it seems worthwhile to investigate whether a higher number of shock waves can be applied to avoid multiple treatments and to keep the advantage of an anesthesia-free mode of treatment.